Il Caduto (The Fallen), 2006, mixed media. Installation view. Entering the main room of Alessandro Pessoli’s latest show in Milan is like stumbling upon a disaster scene that has mysteriously transformed into a giant still life. Through a small, portholelike door, one finds Il Caduto (The Fallen), 2006, a reconstruction of a World War I airplane built to scale. The sculpture, set on a wooden platform, depicts a combat aircraft that was shot down during the war; its remnants were later reassembled in a hangar and photographed. 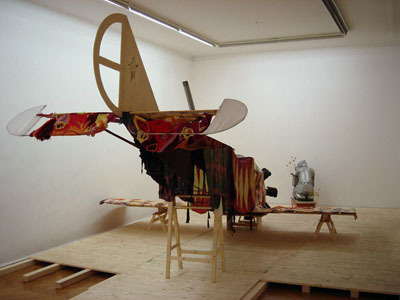 Modeled after this documentation, Pessoli’s interpretation of the wreckage makes of the crash site a patchwork of history: The airplane’s body is wood and metal, while its outer surface is covered with colorful cloths, embroidered wools, hand-painted silks, and even old works on canvas from the artist himself. The frontal engine and its cylinders are made of a shiny, greenish ceramic, converting the dull brutality of this loud machinery into a delicate, mesmerizing object. In front of this bizarre relic, in a meditative, almost religious pose, is the pilot, kneeling down in furtive prayer. Roughly sketched in aluminum, with an irregular yet enchanting surface, the effigy of the man echoes the contours of Futurist sculpture. But around his feet grow a few slender flowers, as though he is turning into his own war memorial. Pessoli, by setting aside his favorite tool—the brush—to explore atypical materials such as fabrics, aluminum, and ceramics, brings his painterly touch to a new, inspired plasticity of his imagination, drawing a melancholic portrait of a past that merges history with fairy tale.